I’m a Chemistry PhD student studying the biochemistry of a type of immune cell, but sometimes it’s fun to learn about a totally different field of science. With that in mind one recent Wednesday evening, I went with a friend to the Carolina Science Café, an event connected with the NC Science Festival, which occurs annually in April, and has events open for a wide range of audiences. A friend and I got some food and listened to UNC geologist Dr. Allen Glazner speak about Death Valley, a famous desert in California. Geology is far out of my realm of expertise, but it’s always interesting to step outside of my scientific comfort zone, and even more fun to share what I learn. Dr. Glazner’s talk opened with some pictures of Death Valley – but with a twist. Images: Far left, middle left, middle right, far right. Death Valley is one of the hottest places in the world, with a record temperature of 134°F. It is a barren landscape with strange features such as the Badwater salt flat and Ubehebe Crater. As a result, Death Valley has drawn scientists for decades, who have used it as a “terrestrial analogue site“, or a stand-in for the behavior of other planets, like Mars. This includes NASA scientists who go to Death Valley to search for clues to extraterrestrial life. Like Dr. Glazner did in his talk, I’ve snuck in a photo of Mars among the photos of Death Valley above! Can you tell which one it is? (Spoiler: it’s #3.) I didn’t notice at all when he did it – maybe you’re sharper than I was. He then focused on three odd features about Death Valley. First off, about 20-30,000 feet of the Black Mountains, a mountain range in Death Valley, were once thought to be missing according to accepted geological theories. The oldest rocks in the Black Mountains are estimated to be at least 1.7 billion years old. Nearby mountains have about 20-30,000 feet of late Precambrian and Paleozoic sedimentary rocks layered on top of the oldest layer — but these are missing from the Black Mountains, which instead have much younger late Tertiary rocks. The issue was solved around 1980, and involved a new geological explanation for where the rocks went. Admittedly, I didn’t understand enough of the geology to follow what it was! His book, Geology Underfoot in Death Valley and Owens Valley seems to explain it more thoroughly if you want to take a stab at understanding it. Dr. Glazner’s second oddity focused on the historical climate of Death Valley. 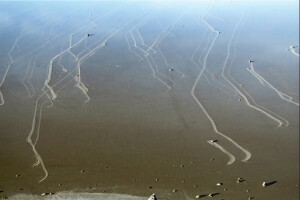 Studies of mud layers and rocks suggested that glaciers had once been present in Death Valley. However, dolomite can also be found in the same areas, suggesting a tropical climate was present! Dr. Glazner explained how ice ages could occur on the geologic timescales of millions of years. This involved the carbonate-silicate cycle, which is an important way that carbon enters and exits the atmosphere via the formation of rocks. He broke the cycle into two major aspects: weathering and volcanism. Weathering is the decrease of atmospheric CO2 through chemical reactions with rocks on Earth, while volcanism is the increase of atmospheric CO2 by volcanic eruptions. Weathering is generally sensitive to the surface temperature of the earth and slows down if the Earth cools down. However, the effects of volcanism are roughly constant and independent of the Earth’s surface temperature. Since CO2 is a potent greenhouse gas, it’s suspected that the slow removal of CO2 by weathering helped drive the Earth into ice ages in the past, until the cold slowed down the weathering process, and volcanism increased the atmospheric CO2 once more. 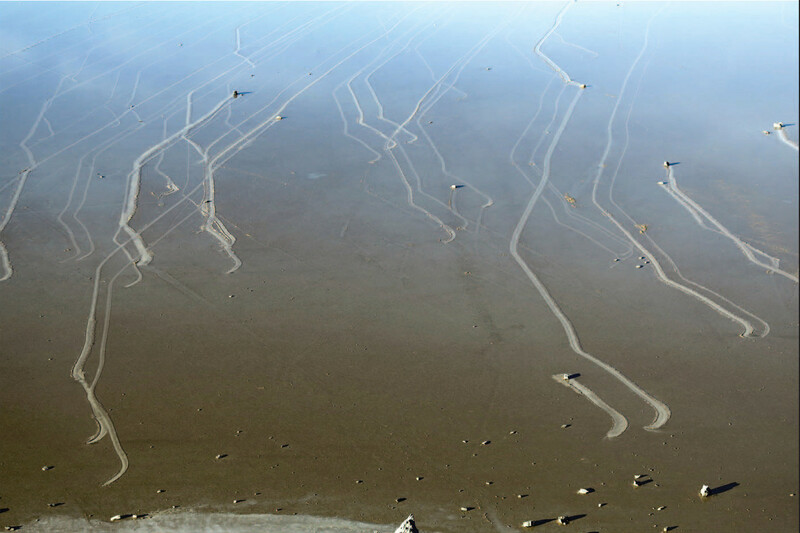 Moving rocks at the Racetrack Playa in Death Valley. Source. This puzzled researchers, who couldn’t explain how these rocks moved, especially in parallel groups as shown above. One researcher even tried putting a pair of rocks “in jail”, setting up a series of metal bars around the two rocks. Somehow, one escaped and travelled, but the other did not. In 2013, however, a team of researchers got permission to install GPS trackers into the rocks, and eventually figured out that the rocks traveled because they became embedded in large floating panels of ice, which could slide along the ground during the winter. I think that stepping outside of my comfort zone as a person and scientist is important, and this was a great way to spend an evening. I hadn’t known too much about geology or Death Valley, but hanging out with a friend and hearing interesting stories was good way to learn.